People are often surprised when I tell them that there’s more to cooking in a campervan than just BBQs or beans and sausages! Don’t get me wrong we all love a BBQ. What could be better than setting up camp, lighting the coals and sitting back with a glass of wine or Somerset cider. We highly recommend The Butchers Block for locally sourced meat. Please let us know if you want a BBQ pack and we’ll have it ready in the fridge for when you pick up your hire campervan. If you want to test your culinary skills, you’ll find all our vans come fully equipped with everything you need to whip up a feast. Here are few of our favourites. What better way to start the day than with a healthy, fruity breakfast and overnight oats are a doddle to prepare the night before. No cooking required! Spoon oats into bottom of a glass, cover with milk. Layer on slices of banana, top with yoghurt, add granola and top with slices of strawberries for a tasty topping. Cover and leave in fridge overnight. Wake up to delicious breakfast. Spicy chicken salad in under 20 minutes? Yes please. To make, roll the chicken in the seasoning (saving a spoon for the dressing) fry in a spoon of olive oil on a low heat for four minutes each side until browned. When cooked leave to rest for few minutes. 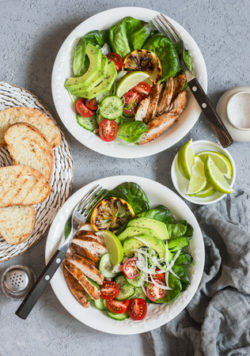 Slice the chicken into strips and lay out on the salad on a bed of romain lettuce leaves. Arrange the remaining salad and pour over the dressing. For a take away lunch, simply wrap the contents into soft tortillas and enjoy lunch in the sunshine. Boil spaghetti until cooked, drain leave to side. In the pan fry the garlic and olive oil for two minutes. Add parsley and white wine. Add tomatoes and salmon and simmer for one minute. Add the spaghetti and toss together. Sprinkle with dried chilli flakes and serve with Pullens sour dough bread slice. Finish with the simplest, most decadent treat and use the microwave to make the perfect, gooiest dessert. Mix ingredients together in the bowl. Pour into a large microwave safe mug. Microwave until the mix is solid, about 2 minutes. Sit back and watch the stars. Cooking in a campervan has never been so gourmet. Contact us now to book your culinary adventure.